Parking on the street is generally free throughout Brno apart from some districts: the city centre and the streets around as shown on the map below. In real life, the parking spots marked with blue lines are the zones where special rules and parking fees apply. If you’ve parked in a spot with blue marks on the ground, check for the nearest vertical traffic sign where the rules will be explained. The parking system is described as residential. It means that local residents enjoy special rights when parking. 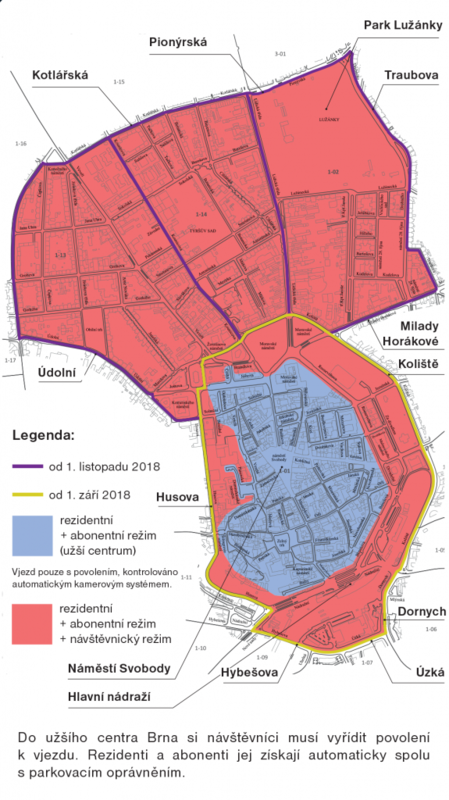 The blue area is where only residents (in Czech: “rezidenti”) and commercial users with their place of business in that area (in Czech: “abonenti”) can drive in and park. The red area is where also visitors can park, although there will be charged. When can I park as a resident? If you are an EU citizen with a temporary residence permit or nonEU citizen with a permanent residence permit with an indicated address in the area that will be affected by the new system, you can now obtain a residential parking permit. With that, you can park in the district of your residence, as well as the neighbouring districts. For example, if you live in the Veveří area and obtain a parking permit for Veveří, you can also park in Údolní area. However, the centre is an exception to this rule: if you have a parking permit for Veveří, you can not park nor drive into the city centre. Only people who live in the city centre can obtain a permit for the centre and park there. With the same permit, they can also park in any neighbouring areas). You can also obtain one hundred “visiting hours” that you can grand to any other car (for example your family visiting, or a moving truck). If your address is not printed on your residence permit, you can only drive and park as a visitor. It is not enough to have a lease agreement for an apartment in the centre: you need to have it specified on your permanent/temporary/long-term residence card issued by the Immigration office. Can I drive into the city centre? If you cannot obtain a residential parking permit for the city centre, you cannot drive into the centre. The Municipality installed cameras to every entranceway, and all unregistered cars will be heavily fined. You can still park as a visitor in the adjacent streets – they are marked red on the map above. Parking for under 30 minutes is free; if you stay longer you can pay at the machines or through a mobile application (once the application is ready to download, we will provide a link here). There are many car parks around the city centre: you can find a complete list here. The Velký Špalíček parking, which is right in the centre, is still available for visitors: the Police camera will register your car entering the centre but it will also register you entering the Špalíček car park and erase your record. The cars registered as carsharing vehicles have a special permit for the centre and can drive and park in the centre as residents. In areas with the residential parking system, parking spots are marked blue. Every car park also has a vertical sign with all the information you need: if there are blue and green stripes only cars with residential/commercial permits can park. If there is also an orange stripe (as shown in the picture) visitors can park, too. The sign also marks the days these rules apply (“Po-Ne” means from Monday to Sunday, i.e. 24/7; or “Po-Pá” means Monday to Friday), as well as hours (for example “8-18 hod”, which means 8 am to 6 pm. On the picture, the “8-6 hod” means from 8 am throughout the whole day to 6 am, i.e. 6-8 am the parking is available for anyone). This type of technical inspection is done by vehicle testing stations (STK = stanice technické kontroly). In the Czech Republic, there are around 350 of them. The charge for the certificate of roadworthiness varies between 600 – 800 CZK. As for the frequency, it is mandatory to have the inspection done every 2 years and in case of a new car 4 years after its purchase. A first-aid kit (Mandatory in all motor vehicles except for mopeds, autocycles, single-axle tractors with a trailer, and electric motor trolleys. It must be kept in a dry, shaded, clean, and easily accessible place. Its contents must be kept in order and replaced before the expiration date). Reflective Jacket – A reflective jacket carried by all motor vehicles. This must be worn in the event of a breakdown or emergency on all roads, expressways, and motorways. It has to be worn when exiting the vehicle and therefore must be kept within the car. Winter equipment – Between the 1st of November and the 31st of March all vehicles travelling on roads with signage showing a picture of a car and a snowflake must be fitted with either winter tyres, marked M&S, or carry snow chains. All cars that use the Czech highway system must display a special sticker (dálniční známka) as evidence of the highway toll. The amount of the toll depends on the weight of the car. For passenger cars up to 3.5 tones the highway toll for calendar year 2019 is 1.500 CZK. Toll stickers for 10 days (310 CZK) or one month (440 CZK) are available. If a car is used for business purposes, its owner is obliged to pay a yearly Road tax (“silniční daň”) about 2.000 CZK a year depending on the engine volume. An insurance policy which pays for damage caused to the property of others, including cars, as a result of a motor vehicle accident. Motor third party liability coverage is mandatory. An insurance policy which pays for damage caused to the property of others and also to the property of the policy holder, including cars, as a result of a motor vehicle accident. Motor damage liability coverage is voluntary in the Czech Republic. Insurance company offering a broad range of life and non-life insurance products for individuals, entrepreneurs and businesses. A large consulting company provides comprehensive and independent financial advice for dealing with family budgets with a focus on individual needs.